Children (Ages 0-5) in Early Care and Education Programs | Propel L.A.
A growing body of research suggests that early care and education create positive long-term impacts on both the individual (e.g. brain development, academic achievement, and higher status and higher-paying employment in the future) and their society (e.g. boost in economic activities, reduction in teen birth rates, and reduction in crime rates). 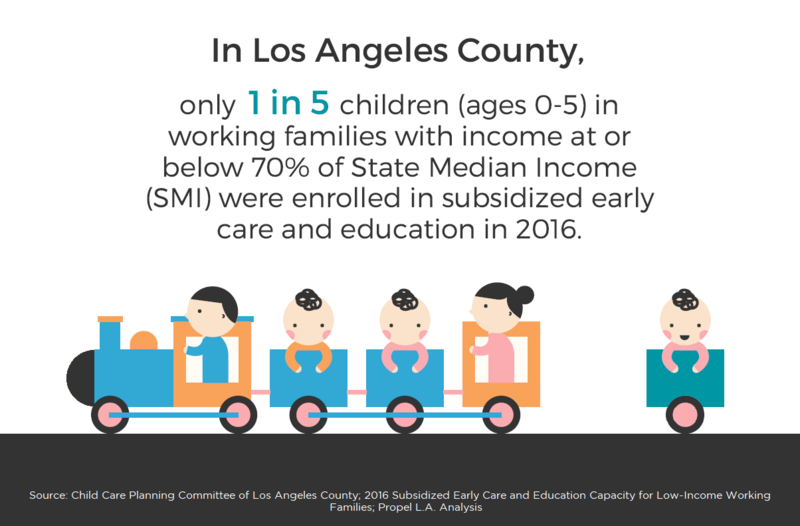 Since only one out of five eligible children are currently enrolled in subsidized early care and education, the County at large should strive to raise awareness and capacity of the programs. Note: The 20% is calculated by dividing 79,000 children enrolled in the programs by the total of 403,000 eligible children in 2016.